If you are a cyclist, it's time to do one of two things: either wind down the summer season or begin the fall rides. The weather seems to imply that it's indian summer ride time, but take your pick. This Saturday you have the choice to take summer's last century in the summery titled Escape From New York, put on by the New York Cycling Club, or head out of the highlands with Bike New York's Twin Lights Ride. Riding out over the George Washington Bridge and getting the hell out of dodge just smacks of the late August urge to flee. While Bike New York's Twin Lights ride just seems considerably more bucolic and autumnal. The ride tours the back roads of Monmouth County, ending overlooking the Twin Lights lighthouse in Sandy Hook. Sure there's a beach involved, but riding through horse country should get you in the mood for argyle and flannel and get you to ditch the seersucker and trade the slicks for knobbies. You must register by 5 p.m. Thursday to sign up for the round-trip ferry from Manhattan. Escape New York takes the opposite route, after crossing the GW Bridge, riders turn north and into the Palisades and West Hudson Valley. 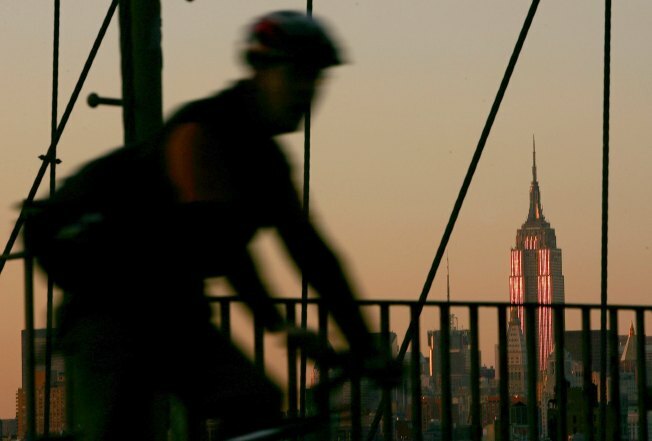 Escape from New York benefits the groups Recycle-a-Bicycle and Transportation Alternatives -- which, it should be noted, will be organizing the fall's first Critical Mass Ride from Union Square on Friday.